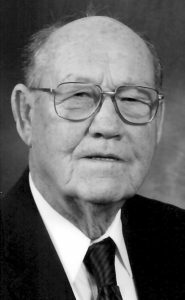 It is with deep sadness, but also gratitude for a life well lived, that the family of Lloyd Alvin Barr announces his death on Wednesday, October 3rd, 2018 at the age of 91 years. A kind man, who always had a twinkle in his eye and a joke up his sleeve, he leaves behind his loving wife Donna and their children: Janis Tanner (Nick Kalynchuk) of Leslieville, AB, Greg (Nettie) Barr of Beaverlodge, AB, Blaine (Carol) Barr of Cardston, AB, Neil (Dena) Barr of Claresholm, AB and Matthew (Shelley) Barr of Coaldale, AB, 11 grandchildren and 9 great-grandchildren as well as his sisters Elma (David) Jessop and Merna Wiedwald. Relatives and friends are invited to gather together to help celebrate his life on Tuesday, October 16th at 1:30pm at Southminster United Church in Lethbridge, Alberta located at 1011 – 4th Avenue South. Private interment will be held at the Union Cemetery in Fort Macleod. In lieu of flowers, the family kindly asks that you please donate to the Heart & Stroke Foundation, or to STARS Air Ambulance, in Lloyd’s memory. Private condolences to the family may be sent via www.edensfuneralhome.com/ notices/Lloyd-Barr. So sorry to read of Lloyd’s passing. My condolences to his family. Always enjoyed a chat across the back fence.